This article is about the World War II gun. For other 6-pounder weapons, see 6-pounder gun. The Ordnance Quick-Firing 6-pounder 7 cwt, or just 6 pounder,[note 1] was a British 57 mm gun, serving as a primary anti-tank gun of the British Army during World War II, as well as the main armament for a number of armoured fighting vehicles. Although planned before the start of the war, it did not reach service until the North African Campaign in April 1942. There, it replaced the 2 pounder in the anti-tank role, allowing the 25 pounder gun-howitzer to revert to its intended artillery role. The United States Army also adopted the 6 pounder as their primary anti-tank gun under the designation 57 mm Gun M1. Limitations of the existing 2-pounders were apparent even as the gun was first entering service, and an effort was made to replace it with a much more capable weapon starting as early as 1938. The Woolwich Arsenal was entrusted with the development of a new gun with a calibre of 57 mm. Guns of this calibre had been employed by the Royal Navy from the late 19th century, and therefore manufacturing equipment was available. The gun design was complete by 1940, but the carriage design was not completed until 1941. The production was further delayed by the defeat in the Battle of France. The loss of equipment - most of the BEF's heavy equipment had to be left behind in France during Operation Dynamo - and the prospect of a German invasion made re-equipping the army with anti-tank weapons an urgent task, so a decision was made to carry on the production of the 2 pounder, avoiding the period of adaptation to production, and also of re-training and acclimatisation with the new weapon. It was estimated that 100 6-pounders would displace the production of 600 2-pounders. This had the effect of delaying production of the 6-pounder until November 1941 and its entry into service until May 1942. Unlike the 2-pounder, the new gun was mounted on a conventional two-wheeled split trail carriage. The first mass production variant—the Mk II—differed from the pre-production Mk I in having a shorter L/43 barrel, because of the shortage of suitable lathes. The subsequent Mk IV was fitted with an L/50 barrel, with muzzle brake. Optional side shields were issued to give the crew better protection, but were apparently rarely used. The 6-pounder was used where possible to replace the 2-pounder in current British tanks, requiring work on the turrets, pending the introduction of new tanks designed to take the 6-pounder from the outset. The Churchill Marks III and IV, Valentine Mark IX and Crusader Mark III all began to enter service during 1942. The Valentine and Crusader both needed to lose a crew member from the turret. Those tanks designed to take the 6-pounder from the outset were the problematic Cavalier, the Cromwell and the Centaur. However, when the Cromwell went into combat in 1944, it was armed with the Ordnance QF 75 mm gun, which was a redesign of the 6-pounder to take US 75 mm ammunition and more useful against general targets. The 6-pounder was also fitted to the AEC Armoured Car Mark II. Although the 6-pounder was kept at least somewhat competitive through the war, the Army nevertheless started development of a more powerful weapon in 1942. The aim was to produce a gun with the same general dimensions and weight as the 6-pounder, but with improved performance. The first attempt was an 8-pounder of 59 calibre length, but this version proved too heavy to be used in the same role as the 6-pounder. A second attempt was made with a shorter 48 calibre barrel, but this proved to have only marginally better performance than the 6-pounder. The program was eventually cancelled in January 1943. Instead, the 6-pounder was followed into production and service by the next generation British anti-tank gun, the 17 pounder, which came into use from February 1943. As a smaller and more manoeuvrable gun, the 6-pounder continued to be used by the British Army not only for the rest of World War II, but also for some 20 years afterwards. A 57/42.6 mm squeeze bore adaptor was developed for the gun but was never adopted. In addition to the UK, the gun was produced in both South Africa, where the Combined Ordnance Factories (COFAC) produced 300, and Canada. The idea of manufacturing the 6 pounder in the US was expressed by the US Army Ordnance in February 1941. At that time, the US Army still favoured the 37mm Gun M3 and production was planned solely for lend lease. The US version, classified as substitute standard under the designation 57 mm Gun M1, was based on the 6 pounder Mark II, two units of which were received from the UK. However, since there was sufficient lathe capacity, the longer barrel could be produced from the start. Production started early in 1942 and continued until 1945. The M1A1 variant used US "Combat" tyres and wheels. The M1A2 introduced the British practice of free traverse, meaning that the gun could be traversed by the crew pushing and pulling on the breech, instead of solely geared traverse, from September 1942. The M1 was made standard issue in the Spring of 1943. A more stable carriage was developed but not introduced. Once the 57mm entered US service, a modified towing point design was introduced (the M1A3), but only for US use. Tractors for the M1 included the Dodge WC-63 1​1⁄2-Ton 6x6 and the White Half-Track. Two-thirds of American production (10,000 guns) went to US Army Divisions in Europe. About one-third of production (over 4,200 guns) was delivered to the UK and 400 guns were sent to Russia through Lend Lease. When the United States re-armed and re-equipped Free French forces for the Normandy landings, their Anti-Tank units received American-made M1s. Like the British Army, the US Army also experimented with a squeeze bore adaptor (57/40 mm T10), but the program was abandoned. American shell designs and production lagged behind the introduction of the gun once it was accepted for service and so, at first, only AP shot was available. The HE shell was not available until after the Normandy landings and UK stocks were procured to cover its absence. Its use by regular US Army front-line units was discontinued in the 1950s. 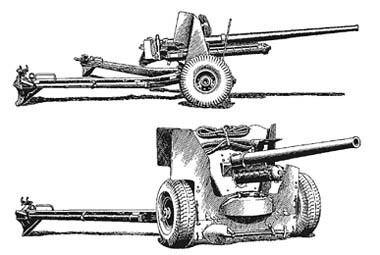 The 6-pounders (and the US-built M1 of which 4,242 guns were received) were initially issued to the Royal Artillery anti-tank regiments of infantry and armoured divisions in the western theatres (four batteries with 12 pieces each) and later in the war to the six-gun anti-tank platoons of infantry battalions. An air-landing battalion had an AA/AT company with two four-gun AT platoons. The Far East theatres had lower priority and different organisation, reflecting the lower tank threat. The gun was also employed by Commonwealth forces in formations similar to the British. Initially, the anti-tank ammunition was a basic Armour-Piercing (AP) shot, but by January 1943 an Armour-Piercing, Capped (APC) shot and an Armour-Piercing, Capped, Ballistic Capped (APCBC) shot was supplied. A High Explosive shell was produced so that the gun could also be used against un-armoured targets. The 6-pounder first saw action in May 1942 at Gazala. It made an immediate impact on the battlefield as it was able to penetrate any enemy tank then in service. In the most celebrated action, the 6-pounder guns of 2nd Battalion, The Rifle Brigade (together with part of 239 Anti-Tank Battery Royal Artillery under command), destroyed more than 15 enemy tanks in the action at 'Snipe' during the Second Battle of El Alamein. However, over the next year, the Germans introduced much heavier designs into service, notably the Tiger I and Panther. The standard 6-pounder shot was ineffective against the front armour at any range, but proved effective on the less armoured sides and rear. 6-pounder gunfire accounted for the first Tigers disabled in North Africa; two Tigers being incapacitated by towed 6 pounder AT guns, while the 48 RTR knocked out the first Tigers by the Western Allies in tank vs. tank action with their Churchill tanks destroying two Tiger I (the same unit also knocked out the first Panther tanks by the Western Allies in May 1944 in Italy). The North Irish Horse disabled and captured Tiger 131 after the crew had abandoned it following it receiving several hits, most seriously a shot which struck the turret ring, making traverse impossible. The situation was somewhat improved by the development of more sophisticated ammunition in the form of the Armour-Piercing, Composite Rigid (APCR) shot and the Armour-Piercing, Discarding Sabot (APDS) shot, which was available from 1944 and made it effective in fighting the Tiger I and Panther tanks frontally. In the Royal Artillery regiments, the 6-pounders were joined by the 17-pounders starting in 1943; but in infantry units, the gun remained the sole AT gun in service until 1951, when it was finally declared obsolete and replaced by the 17-pounder in the British Army of the Rhine (BAOR). The first tank to go into action armed with the 6 pounder gun was the Mark III version of the Churchill tank, in the Dieppe Raid of August 1942. They were deployed to North Africa; six, as 'KingForce', were in action at El Alamein in October (destroying five tanks and three AT guns for the loss of one Churchill). 6 pounder with Molins automatic feed. The Royal Navy used the 6-pounder extensively in Motor Gun Boats during World War II (especially the 'D' type). The gun was mounted on a hydraulic-powered mount and fitted with the Molins power loading system, permitting a six-round burst at one round per second. The guns were all the early short-barrel (43 calibre) type, and fired exclusively HE (high-explosive) ammunition, at much lower muzzle velocities than for AP (armour-piercing), because of the use of flashless propellant for night operations. The naval designation was QF 6-Pounder Mk IIA; nearly 600 of these weapons were made. The Molins autoloader was also deployed on a small number of Royal Air Force de Havilland Mosquitos of Coastal Command, which were referred to as the "Tsetse" (after the biting fly). Officially the QF 6pdr Class M Mark I with Auto Loader Mk III, it was based on the long-barrelled (50 calibre) gun. It was fully automatic, with a rate of fire of about 55 rounds per minute, with an ammunition supply of 21 rounds. It was intended for use against U-boats and fired solid shot that could penetrate their hulls through 2 ft (61 cm) of water. The weapon was successfully used to sink a U-boat and to shoot down a Junkers 88 aircraft. It was replaced in 1943 by the more versatile but less accurate 3-inch Rocket Projectile. 57 mm Gun M1 firing at German bunker near Saint-Malo, Brittany. In spring 1943, following the experience of the North African Campaign, the Infantry branch of the US Army recognised the need to field a heavier antitank gun than the 37 mm M3. The Ordnance QF 6-pounder was introduced into US service as the 57mm M1, following standard US nomenclature. Introduction was made in the face of objections by the US Army Infantry Board, which believed it to be too heavy. The Ordnance Board, on the other hand, felt that a more powerful weapon should be introduced; the Airborne and Cavalry rejected it. According to the Table of Organisation and Equipment (TO&E) from 26 May 1943, a regimental antitank company included nine 57 mm guns and each battalion had an antitank platoon with three guns, giving a total of 18 guns per regiment. Dodge WC-62/WC-63 6×6 1½ ton trucks were issued as artillery tractors in place of the 3/4 ton truck used with its predecessor the 37mm. Because of the unexpected adoption into service, the only ammunition type in production in the US was the AP ammunition. By mid-1944, the M1 was the standard antitank gun of the US infantry in the Western Front and outnumbered the M3 in Italy. Preparation for the D-Day invasion of Normandy highlighted an additional need. The Airborne Command had rejected the 57 mm M1 in the summer of 1943, claiming that it was unfit for airlanding by glider due to its weight and the TO&E of February 1944 still had airborne divisions keeping their 37 mm guns. To increase firepower, the 82nd and the 101st airborne divisions were re-equipped with British-manufactured 6 pounders on the narrow carriage Mk III designed for glider use—24 in AA battalion, and 9 in each glider infantry regiment—for the Normandy airdrops. In the fighting after the Normandy landings, the paratroops used them against German armour near St Mere Eglise and Carentan. However, few tanks were encountered and they were mostly used for support, which made the lack of an HE shell more significant. The British 6 pounder with the MK III carriage was also used by 442 AT Company as part of the glider invasion force assigned at that time to the 517th Parachute Infantry Regiment, First Airborne Task Force, during Operation Dragoon; the invasion of Southern France. Limited availability of different ammunition types limited the efficiency of the gun in the infantry support role. Only after the Normandy Campaign did the HE round reach the battlefield (although US units were sometimes able to get a limited amount of HE ammunition from the British Army). The canister shot was not seen in significant amounts until early 1945. Some British stocks of APDS were supplied to the US units, although APCR and APDS rounds were never developed by the US. From July, US anti-tank units encountered the Panther tank, which was vulnerable to the 57 mm only from the sides. Towed anti-tank guns were less effective in the hedgerow terrain, where mobility suffered; but, when the Germans went on the offensive in August, they were effective in defence with infantry. Subsequently, the guns were officially introduced under the TO&E from December 1944. According to the TO&E, a division was issued 50 pieces: 8 in the divisional artillery, 24 in the AA battalion, and 18 in the glider infantry regiment; parachute infantry regiments did not have anti-tank guns. The British guns were referred simply as 57 mm guns. Towards the end of the war, towed anti-tank units were out of favour due to their lack of mobility compared to self-propelled guns and the 57mm was used by infantry battalions. However, with few tanks to contend with, some units that would have been equipped with the 57mm were instead deployed as rifle companies or only with the Bazooka. The M1 went out of service in the US soon after the end of the war. In addition to being used by the US, British and commonwealth forces, the M1 was supplied under the lend lease program to the Free French Forces (653), USSR (400) and Brazil (57). 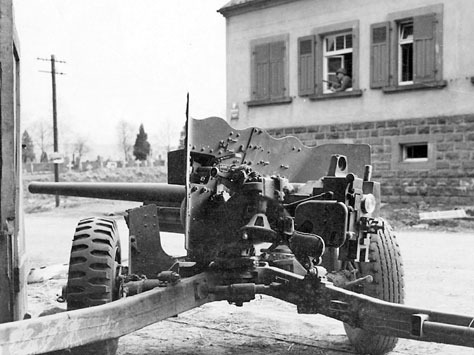 Guns captured by the Germans were given the designations 5.7 cm PaK 209(e) and 5.7 cm PaK 202(a). The Israel Defense Forces employed the 6-pounder in the 1950s in brigade-level anti-tank battalions and battalion-level anti-tank platoons (the latter formations were disbanded in 1953). By late 1955, the Israel Defense Forces possessed 157 pieces and 100 more were purchased from the Netherlands in 1956, too late to enter service before the Suez Crisis. Some of those are described as "57-mm guns, nearly identical to the 6-pounders and firing the same ammunition", which apparently makes them US-built M1 guns. The gun was also used by the Pakistani Army; numerous examples can still be seen as 'gate guards' outside army bases in Pakistan. The Irish Army acquired six 6 pounder anti-tank guns in the late 1940s. The US 57 mm M1 gun is popular with modern-day cannoneers, as there is a relatively good supply of shell casings and projectiles. The gun is also reportedly still in active military use with some South American countries, and in coastal defense emplacements of outlying island garrisons of the Republic of China Army. During the Biafran War, from 1967 to 1970, both the Nigerian Federal Army and the Biafran armed forces, including some Biafran vessels, used the 6-pdr gun. Mk 1: limited production version with L/50 barrel. Mk 2: first mass production version. Shortened L/43 barrel was adopted due to the shortage of suitable manufacturing equipment. Mk 3: tank version of Mk 2. Mk 4: L/50 barrel, single baffle muzzle brake. Mk 5: tank version of Mk 4. Molins Class M gun: 6 pounder gun fitted with automatic loader built by the Molins company, a manufacturer of cigarette making machines. It was mounted on the Royal Navy Motor Torpedo Boats and in the RAF Mosquito planes, which were referred to as the "Tsetse". 57 mm Gun M1: US built version; although based on Mk II, it had the "original" L/50 barrel. A T48 57 mm Gun Motor Carriage in front of the Polish Army Museum. Tank gun versions of the 6-pounder were used in Crusader III, Cavalier, Centaur I and II, Cromwell I to III, Valentine VIII to X and Churchill III and IV, and also in the Canadian Ram Mk II and the prototype American Light Tank T7E2. The Deacon and the experimental Alecto Mk II self-propelled guns also mounted the 6-pounder. Another experimental vehicle armed with the 6-pounder was a Firefly tank destroyer, based on the Morris Light Reconnaissance Car. The only mass-produced vehicle mounting the 57 mm M1 was the M3 Half-track based 57mm Gun Motor Carriage T48 (also known by its Soviet designation SU-57). The production of the T18E2 armored car, also known as Boarhound, was stopped after 30 units were built. A project for a tank destroyer armed with the M1—the 57 mm Gun Motor Carriage T49—was cancelled after a single pilot vehicle was built. Similarly, the wheeled 57 mm Gun Motor Carriage T44, based on Ford 4×4 ¾ ton cargo carrier chassis, was cancelled after a brief testing. * The statistics for British APDS rounds aren't clear about which length of barrel fired the projectile. In use as a tank gun, penetration was 81 mm (for Mark 3 gun) and 83 mm (Mark 5) at 500 yards and target at 30°. ^ British forces traditionally denoted smaller ordnance by the weight of its standard projectile, in this case approximately 6 pounds (2.7 kg). The "7 cwt" - the approximate weight of the gun barrel and breech (cwt = hundredweight of 112 pounds), therefore 7 x 112 pounds = 784 pounds (356 kg) - was included in the designation to distinguish this gun from others also firing a 6 lb projectile. ^ Windrow, Martin (20 September 2018). French Foreign Légionnaire vs Viet Minh Insurgent: North Vietnam 1948–52. Combat 36. Osprey Publishing. pp. 50–59. ISBN 9781472828910. ^ a b c d e f Foss, Christopher (1977). Jane's pocket book of towed artillery. New York: Collier. p. 17. ISBN 0020806000. OCLC 911907988. ^ "Beute numbers • Axis History Forum". Axis History Forum. Retrieved 1 October 2017. ^ When the Engines Roared. ^ a b c Jowett, Philip (2016). Modern African Wars (5): The Nigerian-Biafran War 1967-70. Oxford: Osprey Publishing Press. pp. 17–24. ISBN 978-1472816092. ^ Bird, Lorrin; Lingston, Robert (2001). World War II Ballistics: Armor and Gunnery. Albany, NY USA: Overmatch Press. pp. 60, 62. OCLC 71143143. ^ Young, Peter (1972). The Arab Legion. Men-at-Arms. Osprey Publishing. p. 24. ISBN 0-85045-084-5. Chamberlain, Peter; Terry Gander (1974). Anti-Tank Weapons. WWII Fact Files. Arco Publishing Company, New York. ISBN 0-668-03505-6. Fletcher, David (1983). Cromwell Tank: Vehicle History and Specifications. The Tank Museum. HMSO. ISBN 0-11-290403-3. Hunnicutt, R. P. (2002). Armored Car: A History of American Wheeled Combat Vehicles. Presidio Press. ISBN 0-89141-777-X. When the Engines Roared: 50th Anniversary to the Sinai War (ברעום המנועים: 50 שנה למלחמת סיני ). Ministry of Defence, Israel. 2006. ISBN 965-05-1337-X. Zaloga, Steven J. (2005). US Anti-tank Artillery 1941-45. New Vanguard 107. illustrated by Brian Delf. Osprey Publishing. ISBN 1-84176-690-9. Zaloga, Steven J. (2007). US Airborne Divisions in the ETO 1944-45. Battle Orders 25. Osprey Publishing. ISBN 9781846031182. Wikimedia Commons has media related to QF 6 pounder. Wikimedia Commons has media related to Molins 6 pounder. This page was last edited on 10 February 2019, at 09:18 (UTC).